Transportation and parking information, coupled with numbers for downtown Denver workers and residents, appear to back up the conclusion that 1 million attendees was far too high of an estimate for the Denver Broncos Super Bowl entertainment, parade and rally on Feb. 9. That was measured in part by automated passenger counters, according to RTD spokesman Scott Reed. Those electronic devices typically use infrared beams, invisible to passengers, above doorways to make counts of boarding and alighting passengers. However, even though ridership broke an internal record, the increase was low in comparison to what would be needed to help reach a 1 million number. RTD’s ridership increased by 89,000 passenger boardings that day versus a regular weekday. Passenger boarding’s rose to 409,000 from a typical weekday’s 320,000. Since each person at the parade would have typically produced two passenger boardings (producing one boarding coming and one returning from the event), the 89,000 increase in boardings would have meant an increase of 44,500 people taking public transit in metro Denver that day. And 44,500 is probably high because it doesn’t count transfers. If a person transferred once each way, that person would have generated four passenger boardings. Alexandar Kollaritsch, the Austrian expert who provided the most detailed Feb. 9 crowd analysis to the Post-Telegraph and estimated attendance at 198,000, thinks the RTD increase in boardings is significantly small. 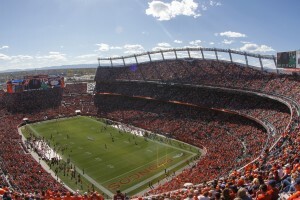 While it represents a 28 percent increase in boardings, the total increase in number of people transported appears underwhelming in comparison with the 1 million-person estimate from the Denver Police Department, even if one assumes that all 44,500 people in the increase attended the Broncos event. “If there would have been 1.000.000 persons [Austrian way of writing 1 million] there would have been more passengers on public transport — beside the fact that the public transport system would have collapsed at that number of passengers,” Kollaritsch said in an email. As it was, RTD felt the strain, even with the modest increase. Nate Currey, a spokesman for RTD, said that the Littleton and Mineral light rail stations “were just packed” that Tuesday morning of the parade, and “we recognized that that can turn into an ugly situation.” So RTD — realizing it didn’t have the staff to handle the crowds on a paid basis, and with thoughts of free rides being a nice community gesture — made it a free day for passengers at about 10:30 or 11 a.m. that morning, he said. “Ultimately it was a safety factor,” said Currey. The “on-the-fly” decision was well-received by passengers, he said, but RTD did give up some revenue. Insufficient downtown parking also appears to call into question the 1 million estimate. Aylene McCallum, director, downtown environment at Downtown Denver Partnership, said the DDP estimates that there are about 42,000 public parking spaces in the area of downtown bordered roughly by 16th and Wynkoop on the northwest, Park Avenue on the northeast, and 12th Avenue on the south. Heather Burke-Bellile, a marketing and communications specialist with the city, said in an email that there are 3,676 parking spaces available to the public at off-street garages owned by the city. And there are another 3,000 on-street metered spaces in the downtown area. Add those to the 42,000 in the core area of downtown, and that makes about 49,000 parking spaces available. But a very high percentage of those spaces appear to be already filled by downtown workers. McCallum said that 38 percent of downtown workers drive to work alone. There are 120,871 workers in downtown Denver, according to the DDP. Thirty-eight percent would take up 45,930 spaces. Plus, another 5.2 percent, or 6,285, carpool. Assuming an average of three to a carpool, that would be another 2,000 spaces taken up by commuters — for a total of about 48,000 spaces demanded just by downtown workers. McCallum noted that there are some employers who have private parking areas for their employees that are not included in the public parking numbers, but she didn’t have numbers for those private parking areas. And the parking area measured by DDP does not include a big area outside of those boundaries that are within walking distance of Civic Center and the parade route. Plus, the Pepsi Center, which is excluded from DDP’s parking numbers, does have monthly daytime, daily daytime, event and permit parking on its property, and it did open its lots to parking for guests on the day of the Broncos parade, said David Jolette, senior vice president of venue operations. “We have 5000 spaces and offered parking at $10 in the parade time window,” he said. The Broncos’ Sports Authority Field, on the other hand, was not available for parking for the celebration, according to Rebecca Villanueva, corporate communications manager for the Denver Broncos Football Club. “We did not provide parking for the parade. An impossible task for over 1 million fans,” she said in an email. Even so, there are 12,000 offsite parking spots located near the stadium area, according to the Broncos website. Coors Field did not respond to a query about its day-of-parade parking policy. On the face of it, there doesn’t appear to be a lot of extra parking downtown for an influx of Broncos event drivers, and it raises the question of how Denver’s parking and public transportation infrastructure could possibly have handled even half of the 1 million people estimated. A Post-Telegraph survey of bus commuters, taken at the Civic Center bus station on March 1 and March 8, indicated that, of 50 people surveyed, 16 (32 percent) went to the Broncos parade, 23 (46 percent) did not go to the parade, and 11 (22 percent) watched the parade from the inside of buildings. While the survey had a small sample size, it still provides some indication of the attendance at the parade by downtown workers. Even if one counted the people inside of buildings as attendees of the parade — which the Denver Police Department did, according to DPD spokesman Doug Schepman — a 54 percent calculation (32 percent plus 22 percent) yields a number of a little more than 65,000 downtown-worker attendees at the event. It should be noted that counting people viewing the parade from inside the buildings downtown was questioned by Paul Yip, professor in social sciences at the University of Hong Kong and an expert who estimated the Feb. 9 Broncos event attendance at 200,000. And G. Keith Still, professor of crowd science at Manchester Metropolitan University (UK), noted that the estimate of 198,000 by his student Alexandar Kollaritsch did not include anyone viewing from inside buildings. The Downtown Denver Partnership says that 69,872 residents live within a 1.5-mile radius of the center of downtown. Even assuming no overlap with Denver’s downtown workers (Seattle has 30 percent of its downtown residents working downtown) 54 percent of that would be about 38,000 attendees from residents in or near downtown who walked or bicycled to the event. Then there are about 42,000 students and 5,000 faculty and staff members using the Auraria Campus. downtown. A Tuesday, March 8 Post-Telegraph survey of 50 people on campus (48 students and two staff members) showed that 11 (22 percent) of those surveyed went to the parade and 39 (78 percent) didn’t. Forty-one percent of students surveyed said they come to campus two or fewer times a week, so one might assume 59 percent of students, or 24,780, were on campus Feb. 9. But of those, only 22 percent, or slightly less than 6,000, attended the event. Figure another 1,100 staff members (22 percent of 5,000), and that totals about 7,000 students and staff members attending. But the survey also indicates that of those who went, 36 percent took light rail (already accounted by RTD) and 64 percent, or 4,500, walked. Taxicab and ride-sharing numbers were not made available despite requests made to taxi companies Metro Taxi and Yellow Cab and ride-sharing companies Uber and Lyft. However, according to The Denver Post, metro Denver had 1,604 cabs as of 2011, Uber had 2,000 drivers in Colorado as of June 2015, and it planned to add another 1,000, making 3,000 total. Assuming that happened and that its metro Denver/Colorado driver ratio mirrors the population ratio, metro Denver would have 1,800 Uber drivers. Lyft has about one-tenth as many rides per month as Uber, so assume 180 drivers for Lyft. Altogether, that makes about 3,600 taxi and ride-sharing vehicles to take people to the event. Assume three round trips with two passengers per vehicle on Feb. 9, and that translates to 21,600 people taken to the event by vehicles that weren’t their own. Add those 21,600 to the 65,000 downtown workers, the 38,000 downtown-area residents, the 4,500 from campus, and the 44,500 from RTD’s increased ridership, and that’s 173,600. Assuming those numbers are correct, reaching Kollaritsch’s estimated 198,000 attendees would mean 24,400 people coming from outside downtown Denver in their own cars, bicycles or motorcycles. Considering the tight parking situation in downtown, 24,400 appears like a formidable number needed to reach Kollaritsch’s 198,000. To reach the 1 million estimated by the Denver Police Department would mean figuring out how another 802,000 people managed to get there.